This beautiful mountain retreat located 1.6 miles from town was once owned by the legendary Dinah Shore. From top to bottom, this cabin has all the comforts of home while giving you the feeling that you have traveled back to a simpler time. Enter the home via the beautiful front deck. It is fully furnished and surrounded with a lovely view to enjoy while you have cocktails or bar b q. Grab your morning coffee and listen through the quiet to all of Idyllwild's little critters from the vintage porch swing. The birds, the squirrels, and frequent deer are incredible to watch from the deck. Enter on the main level into a the living room and snuggle up on the couch to watch tv or write a post card on the little desk while keeping cozy warm in front of a roaring wood fire place. Past the living room, is a beautiful kitchen which has an antique wood stove (next to the modern stove) and a table so big, its fit for a king. All the comforts of home with a the feel of days past. Through a small hallway you will pass a bathroom with shower. Down a few steps you enter the master suite. This room includes a queen size bed, beautiful furniture, walk in closet, another wood burning fireplace, a big cozy chair, and floor to ceiling sliding glass doors. 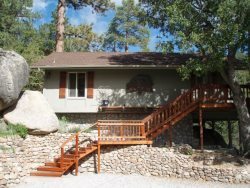 Enjoy sitting on the small deck outside or just open the curtains to soak in the incredible Idyllwild view from your bed. Adjacent to this room is a darling full bathroom with charming pine walls and complete with pink tub, toilet, and sink chosen by Ms. Shore. Return to the living room and ascend the stairs to the upper level. The gorgeous pine walls continue into this adorable A frame room. There are two twin beds and a tiny deck separated by a small hall with two closets. On the other end, there is a full size futon under an incredible vintage stained glass window and a half bath. All the rooms in this house are very bright and large and the vintage decor and pine walls throughout this home will really wow you.